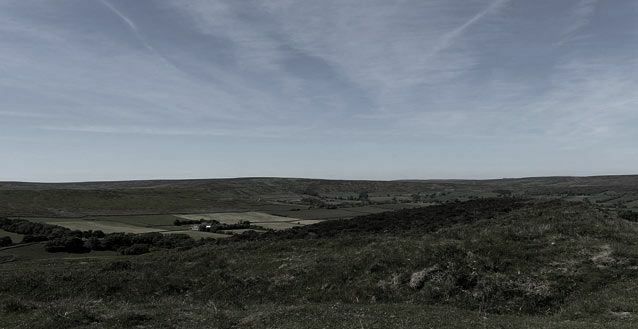 With its tales of hauntings, UFO activity and alleged satanic murder, Brinklow Hill, Leicestershire is one of the mysterious sites in Britain. In 2003 I discovered after meeting a number of occult studies researchers that over the years my studies into Earth Mysteries have often related (un-beknowing to me) to the researches and publications of historical researchers and psychic questers Andrew Collins and Graham Phillips. I began to explore their publications and research documents and cross checked them with my researches over the period of 1991 – 1994 to see how they compare. 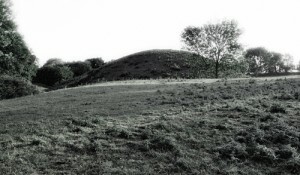 My first article deals with the mysterious Brinklow Tump (also known as Brinklow Hill). The Warwickshire town of Brinklow has a notable topographical feature – an imposing grassy mound known locally as the Tump. Built on a natural rise, and offering a striking view of the surrounding countryside, the hill and its nearby earthworks represent one of the best preserved motte-and-bailey castle sites in the country. However, the name of Brinklow itself suggests a much older settled community, or at least a site that was important to people long before the Norman Conquest. The name is thought to originate from two Old English elements: the personal name Brynca, and the word hlaw, meaning “hill” in the sense of tumulus or burial mound. This ancient derivation implies that there was almost certainly a man-made “tump” here long before the Normans exploited the site to build their castle. The mound was already at least 500 years old when the Normans decided to build upon it. The Fosse Way, which is Roman road running 200 miles from Exeter to Lincoln, deviates in its straight course here and only here to go around the mound. To date, the mound at Brinklow remains unexcavated, so it is not known for certain whether it is the final resting place of some minor British chieftain, circumvented by the Romans, or later owned by an Anglo-Saxon called Brynca, even perhaps the grave of Brynca himself. 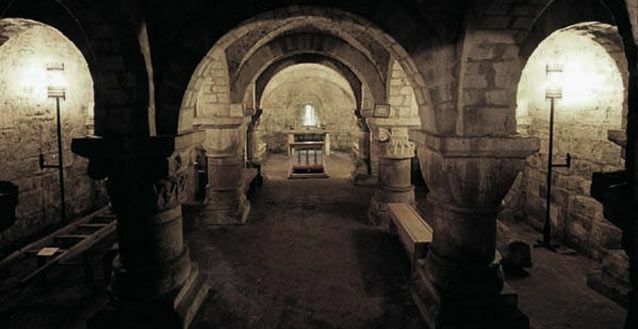 What does seem certain is that there was some form of settlement or human activity long before the Normans built their castle or later their fine church dedicated to St. John the Baptist. The following is a brief introduction to the mysteries that were promoted by Graham Philips, a “historical detective” and one time psychic quester. During the early 1980s and 1990s he wrote a series of books (whose researches were also published and Andrew Collins) about psychic quests in the Midlands of England. The books began with “The Green Stone” – about the finding of the Meon Stone and its relation to a possible occult death on Meon Hill. Soon followed “Eye of Fire” centred around the strange activity around Brinklow Hill and a character called John Lang. In a further article Graham also claims “For over a century the ghost was said to haunt both Brinklow Hill and the Raven Inn that stands just below it. 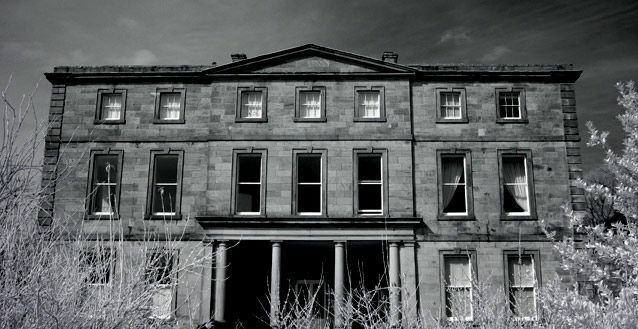 Not only was the ghost of a dark Victorian figure said to have been seen in the bar, but frightening poltergeist activity was reported by both the landlords and patrons alike. The ghost was even claimed to have been caught on film when a group of researchers photographed Brinklow Hill. After reading The Green Stone and the other related books I began to look into my own research in the area. During the early 1990’s I often studied Earth Mysteries and Leys in Warwickshire and Leicestershire, not knowing of Philip’s publication or supposed incidents. Back tracking through my researches and reassessing the case, I can provide what could be additional information that could back up Philip’s theories and ideas. Firstly I decided to analyse old ordnance survey maps of the area to see if there were any further clues to the origins of the paranormal activity. By road the Tump is approached by Ell Lane, which could hint at sun worship. The name “Ell” links with the Greek “ele” meaning “refulgent” or “Torch/A Bright one”. Ele also obviously links with Helios, the Greek god of the Sun. The reverence of the sun as a god came from the east to Greece where he was a popular god, in fact the Colossus of Rhodes was in his honour. People sacrificed oxen, rams, goats, and white horses to Helios. The Cabalists (one of the oldest and most influential subgroups in the whole Order of Hermes) also understood “Ell” to mean “the most Luminous”. It certainly seemed interesting that an ancient pathway next the Tump could insinuate Sun worship, but could there be other clues? At first I didn’t notice it but it was there in front of me all the time – St John the Baptist’s church. The church was built in 1215, it was an early Norman church although extensively altered in the late 18th century. It dedication to St John the Baptist is a further clue to possible sun worship. St John the Baptist is a midsummer solar saint, his feast day usually given to hill top churches associated with pre-christian solar deities. During the summer solstice these sites were known to burn bonfires, even today, people in East Europe still mark Midsummer’s Eve with festivals or dances and bonfires that light up the night sky. I decided to look at the name Brinklow Hill again and to see if there could be any clues in the name itself. When checking the name Brynca, I noticed that in Welsh the name Bryn also means “ mount that is a large hill” and that Low mean “valley”. Further more, if we stay with the welsh translation, Haul is welsh for Sun. So if we look at the name again in Welsh we have the name “Sun Hill over the Valley”. Could this be the right translation or just conjecture? I also looked at the names of the public houses in Brinklow and both have interesting names. “The White Lion” is one name that has instantly links to the sun – the Lion is a solar symbol, Christ’s resurrection is often symbolised by the Lion as well. “The Raven”, links to Bad News, a Bad Omen. The Mithraic cults would sacrifice the Raven for being the messenger of the gods. Another possible clue comes from Graham Philip’s whose investigation of Brinklow Hill included a possible bizarre ritual murder. 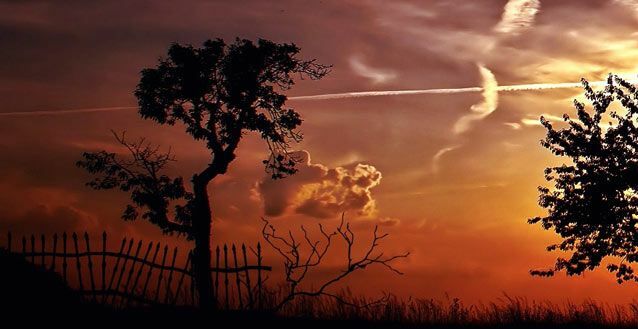 If John Lang was an alleged Satanist working in the area at the time, could it be that he too noticed the connection between Brinklow Hill and the Solar Worship? In magical tradition, Lucifer (meaning ”light-bringer”) was the sun god and brother of Diana, the moon goddess (Not to be confused with the Christian “Lucifer”, also known as Satan). It would be interesting to find out if Sarah Haynes was murdered near or on the Mid-Summer Solstice. Again I must tell you that I have not read the Eye of Fire, but looking at my correspondences back in 1990, I was able to find a report of a psychic quest at Brinklow Hill undertaken by Rita Goold (a physical medium) and Clive Potter, who is still a UFO researcher and psychic quester. “On Sunday September 17th 1989, four people met up at Brinklow, one of the party, Rita Goold had received psychic suggestions that something of interest was buried on the hill. Using dowsing rods two 6” daggers (or paper knives) were located, buried either side of a stile that forms one of the entrances to the site. After a heavy down pour the team decided to leave the hill and drive back to Leicester with Rita. As they drove Clive noticed that in the back of the car, the dowsing rods appeared to be moving and jumping more than would be expected from the surface of the road. At that moment Rita alerted Clive to a mysterious light above the trees to the left of the road. The light was white and the size of a pea at arm’s length, it did not hurt the eyes to look at and the light now seemed to be travelling in the centre of the road. It then descended in a feathery motion causing them to brake. The light was stationary for a second so Rita began to reverse her car, concerned for the safety of her car. The light moved towards them for about 10 seconds then moved from the right and hit the road about 5 car lengths in front of them. The light then increased speed and caused a “whooshing” sound as it passed and rocked the car. The white light continued to hit the road. They turned round to watch the light as it disappeared round a bend in the road. Stretching across Warwickshire there are a series of leys and one of them runs through Brinklow. The Brinklow Ley begins at Coombe Abbey where Graham Philips alleges that John Lang used to meet an occult society. In the grounds of the abbey is a small and inconspicuous mound, 40ft in diameter and 3 feet high, there is a possibility it could be a recent mound, however Coombe Abbey did replace an earlier settlement. The ley then continues along the Fossway through Brinklow Hill and then on to the Easenhall Church and then a nearby Earthworks. The ley continues to Cotton House, a mound and possibly a late eighteenth century folly. The Brinklow Ley is an east-west alignment and with at least two churches associated with it. I do believe that further investigation does need to take place to further validate it. Over the years I have interviewed many Brinklow residents about the hill and its unusual atmosphere, indeed some residents have been witnesses to some very strange paranormal activity. Its seems that the phenomena that was discussed over twenty years ago still continues today even if Graham Philips believes that he may have rid the Hill of its hauntings. Another article about my further research and investigation of Brinklow will appear in the not to distant future, I hope to track down Clive Potter about the psychic quest and subsequent UFO sighting and I am currently interviewing further witnesses to the paranormal phenomena of Brinklow Hill.